Commercial drivers – particularly those who ferry human passengers or hazardous materials – are beholden to more stringent federal and state rules when it comes to their conduct on the road. For instance, F.S. 322.61 disqualifies commercial drivers from operating a vehicle for a year if they are convicted of operating a commercial vehicle with a bodily-alcohol concentration of 0.04 or higher. For most other adult drivers, the limit is 0.08. If a commercial drivers is convicted of two or more serious offenses (i.e., reckless driving, following too closely, unlawful speed of 15 mph or more over the speed limit, causing a crash resulting in serious injury or death, etc.) in a span of three years, the driver will be disqualified from driving a commercial vehicle for 60 days. However, there are some apparent loopholes, as a recent bus accident revealed. Last month, U.S. News & World Report detailed the background of a bus driver who ran a red light and slammed into another bus in New York City, killing himself and two others. It was later publicly revealed the driver had a history of crashes and even a drunk driving conviction. However, he was still legally permitted to drive under federal rules that grant “one strike” before a driver can be banned for life. The driver in question lost his job as a city bus driver two years ago, after pleading guilty to a drunk driving hit-and-run crash in another state. He was off-duty at the time. He was given 18 months on probation, but then got into another crash last summer in his personal vehicle. Despite this, he was not legally prohibited from getting behind the wheel of a bus. He was hired by a commercial carrier charter bus company. He had a valid commercial license at the time. At the time of the crash, his bus was empty, but after crashing into another bus, careening over a sidewalk and slamming into a building, 16 people were injured and three died. It’s not certain when he started working for the private company, but it’s plausible the company didn’t know about his recent drunk driving conviction. Motorcoach carriers that are privately operated aren’t mandated by federal law to conduct criminal background checks on their employees. The rules are different for school bus drivers, as well as those hauling dangerous materials. Unfortunately, the Federal Motor Carrier Safety Administration only allows for suspension of one’s license for a year for conviction of certain offenses (i.e., drunk driving, leaving the scene of a crash). After that, the individual may be free to return to work. It’s only after a second conviction on these offenses that they would be banned for life, though some could potentially have their license reinstated after 10 years. That doesn’t mean the carrier can’t still be held liable in civil court, even if they didn’t break any laws. These cases are not predicated on violation of the law beyond a reasonable doubt, but rather a breach of duty resulting in damages to others, proven by a preponderance of the evidence. 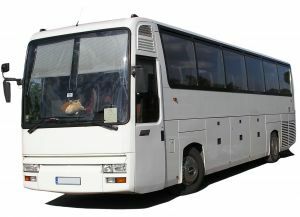 As our Fort Myers accident attorneys can explain, a bus company in this situation could potentially be held liable for negligent hiring and negligent supervision. One could argue the company owed a duty of care to the public to ensure drivers were properly vetted to prevent reasonably foreseeable problems. A recent drunk driving conviction – not to mention the other crashes – should have been a red flag. If you are injured in a commercial vehicle crash, our dedicated attorneys can help you explore all legal options.